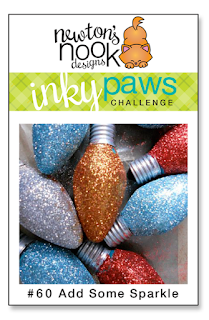 This biweekly challenge was a Theme Challenge-Add Some Sparkle! 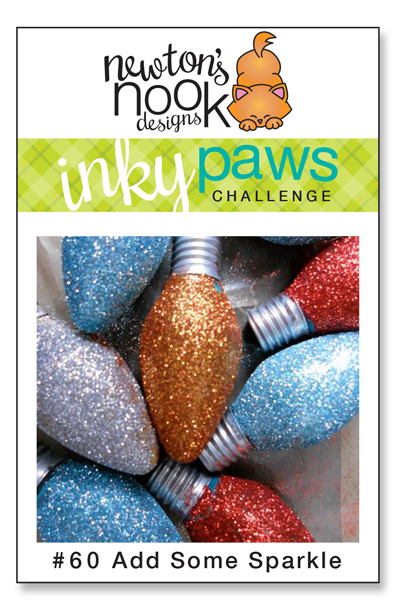 Inky Paws Challenge #60 Winner! 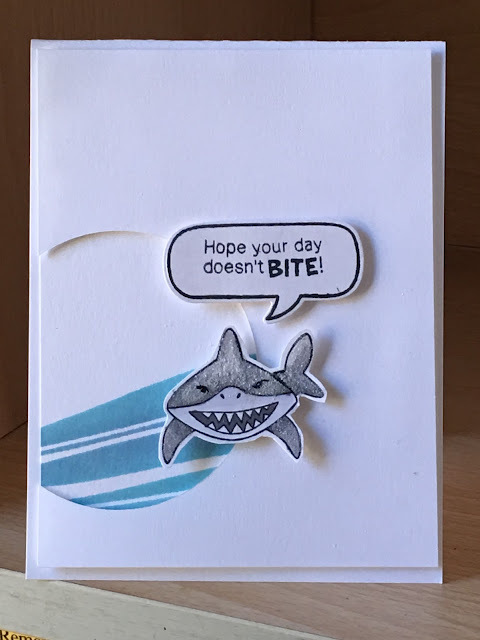 Sue T. adds sparkle to this cute shark from Shark Bites stamp and die set. I love the waves in the window she creates. 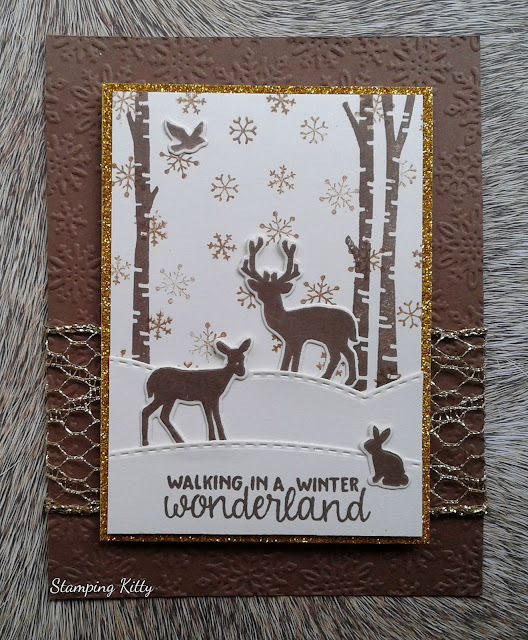 Stamping Kitty uses Serene Silhouettes stamp and die set to create this gorgeous winter scene. We love the metallic mesh to add a bit of texture and sparkle! We love how Birte uses no-line coloring on Winston from Sweater Weather stamp and die set. We also love her sparkly background! Tracie C. use of gold accents and rich, dark colors make this a fabulous design. She is showcasing Holiday Hounds stamp set! Isn't that puppy adorable? Dawn's use of the Polaroid frames showcases these delightful felines in Newton's Holiday Mischief stamp set wonderfully. I also love the background Dawn created. 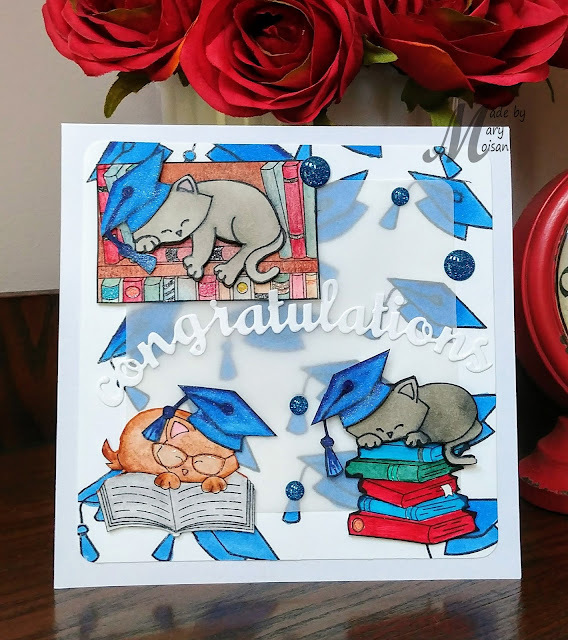 We love how Mary Moisan brings us this fabulous congratulations card using Newton's Book Club stamp set. The fun background and vellum combined with the sparkle on the cute images make it a perfect masterpiece. That's awesome! Thank you so much to Diane for choosing my card as your favourite! I am honoured! Congratulations to the winner and other favourites! I always enjoy looking at them - it's wonderful inspiration! So much cuteness! Thank you for the fav Emily! :) Blessings! Thanks everyone- so excited to be a winner!! I know just what stamp set I am getting!! Happy dance to all winners! Yeah! Lovely work! Thank you @ Andrea for choosing my card. They're all so cute!